/ Is America the Greatest Country on Earth? Infant Mortality: According to the CIA World Factbook, in 2011 it is estimated that 6.06 infants die per 1,000 live births in the United States, which makes the United States tied for forty-seventh with the Faroe Islands in that category. Monaco ranks first, with 1.79 deaths per 1,000 live births. Education: According to Pearson, the United States (January 2015) has a “cognitive skills and educational attainment” score of 0.39, which makes the United States rank fourteenth out of forty countries ranked in that category. South Korea, Japan and Singapore are top three. Ignorance: According to the research firm IPSOS Mori, as of October, 2014, the United States ranks second out of fourteen countries in general ignorance about social statistics such as teen pregnancy, unemployment rates, and voting patterns. Italy is the most ignorant of the fourteen countries. Freedom of the Press: According to Reporters Without Borders, the United States has the forty-sixth freest press in the world (sandwiched between Romania and Haiti), a decline of thirteen spots from 2013. This decline was one of the biggest in the world. High School Literacy: According to the Program for International Student Assessment, the average reading literacy score for U.S. fifteen-year old students is 498 (out of 1000 possible points). That is enough to make the United States rank twenty-fourth out of sixty-five educational systems ranked in that category. Shanghai, China, ranked first, with a score of 570. Educational Performance: According to the 2013 report, The Learning Curve, developed by the Economist Intelligence Unit, the United States ranks seventeenth out of forty countries ranked in overall educational performance. Finland ranks first followed by South Korea and Hong Kong SAR. World’s Best Education System: According to worldtop20.org, amongst world’s top 20 Education System for children as of 2017, America is nowhere in sight. Top ones are South Korea, Japan, Finland, Singapore, Russia, Denmark, UK, New Zealand and China, in that order. Math and Science: The most recent PISA (Programme for International Student Assessment) results, from 2015, placed the U.S. an unimpressive 38th out of 71 countries in math and 24th in science. Among the 35 members of the Organization for Economic Cooperation and Development, which sponsors the PISA initiative, the U.S. ranked 30th in math and 19th in science. Death by Violence: According to the National Academy of Sciences, in 2008 the United States had a death-by-violence rate of 6.47 per 100,000 people. That is enough to make the United States rank first out of seventeen “high-income democracies” ranked in that category. The second-ranked country was Finland, with a death-by-violence rate of 2.24 per 100,000. Japan, Austria and Norway were the least violent. Incarceration: According to the Brookings Institution, in 2013 there were 710 Americans imprisoned for every 100,000 residents. This makes the United States rank first out of thirty-four OECD countries ranked in that category. The average incarceration rate among the OECD nations is 115. Most Prisoners: According to the International Centre for Prison Studies, as of January 31, 2015, there were 2,228,424 prisoners in the United States. That is enough to make the United States rank first in that category. The second highest number of prisoners is in China, at 1,701,344. Drone Strikes: According to the Pew Research Center, 61% of Americans “support the use of drones to target extremists in countries like Pakistan, Yemen and Somalia.” That is enough to make the United States rank second out of thirty-nine countries ranked in that category. Israel ranks first, with 64% of Israelis supporting such strikes. Super Rich: According to the Credit Suisse Global Wealth Report, 2013, there are 98,700 “ultra-high net worth individuals” in the world, those with a net worth of at least $50 million. Forty six percent of those individuals (45,650) live in the United States. That is enough to make the United States rank first in that category. This is nothing to be proud of when you look at the extent of inequality in America. Inequality: U.S. ranks 23rd out of 30 developed countries for inequality with 30 being worst, according to World Economic Forum report dated January 16, 2017. The United States is one of the richest countries in the world. It is also one of the most unequal. As a report released shows, the U.S. ranks 23 out of 30 developed nations in a measure known as the “inclusive development index,” which factors in data on income, health, poverty, and sustainability. Gender Equality: The US, the world’s biggest economy, ranks below Kazakhstan and Algeria for gender equality, according to a report showing the countries that offer the most opportunities for girls. Niger was named the worst country in the Girls’ Opportunity Index, compiled by Save the Children to mark International Day of the Girl. The US came 32nd in the index due to its low representation of women in parliament, high teenage pregnancy rates and its record on maternal deaths. Fourteen women died per 100,000 live births in the US in 2015, a similar number to Uruguay and Lebanon. Peace-loving Nation: According to the 2014 Global Peace Index prepared by the Institute for Economics and Peace, the United States has a peace index score of 2.137, which makes the United States rank one hundred and first out of one hundred sixty-two countries ranked in that category. The United States is ranked between Benin and Angola. The most peaceful country in the world is Iceland, with a score of 1.189 Denmark and Austria are 2nd and 3rd. Minimum Wage: According to World Economic Forum, United States is no. 11 in minimum wage among world’s developed countries. Australia, Luxembourg, Belgium, Ireland and France being top five in that order. Working Hard: As of July 2013 report, according to the OECD, in 2012, the average American worker worked for 1789.9 hours, which is enough to make the United States rank eleventh out of thirty-seven countries ranked in that category. Mexico ranks first, with the average Mexican worker working 2225.7 hours in 2012. Greece and Chile are next, followed by Russian Federation. Gun ownership & Gun Violence: The death rate due to firearms in the U.S. is nearly double the global average, according to the Global Health Data Exchange. Research published in the American Journal of Medicine last year found that Americans are 25 times more likely to be killed by firearms than people in other developed countries. Among countries ranked by total gross domestic product, rate of death by firearm assaults in the U.S. was more than 10 times higher than the next four highest countries combined, according to data from the Global Burden of Disease. Those four countries are China, Japan, Germany and the U.K. Poverty Rate: According to Oxfamamerica.org, of the 19 OECD nations, the USA has the highest rate of income disparity and poverty other than Mexico and Turkey. UN Poverty Index: US ranks 17th out of 19 countries. According to the OECD, the U.S. poverty rate is the highest in the developed world. Child Well-being: According to UNICEF, the United States ranks twenty-sixth out of twenty-nine developed countries in terms of the overall well-being of children. Netherland, Norway and Iceland are top three. Child Poverty: According to UNICEF, 23.1 % of American children under the age of seventeen live in poverty, which makes the United States rank 2nd out of 35 economically advanced countries. Romania ranks 1st, with 25.5% of children living in poverty. Freedom from Corruption: According to the Heritage Foundation’s 2013 Index of Economic Freedom, the United States has a “freedom from corruption” score of 71, which makes the United States rank twenty-fourth out of one hundred seventy-seven countries ranked in that category. New Zealand ranks first, with a score of 95, followed by Denmark and Finland. Arms Exporter: Ten countries are responsible for the vast majority of all major arms exports, accounting for 90 percent of global sales, according to a report by the Stockholm International Peace Research Institute (SIPRI) dated February 22, 2017. The world's top five major arms exporters are the United States, Russia, Germany, France and China. Together, they account for 74 percent of the total volume of exports. This rank is nothing to be proud of. America is in reality, the greatest “merchant of death and destruction”. Economic Freedom: According to the Heritage Foundation’s 2012 Index of Economic Freedom, the United States has an economic freedom score of 76.3, which makes the United States rank tenth out of one hundred seventy-nine ranked countries. Hong Kong ranks first, with an economic freedom score of 89.9. Income Inequality: According to the CIA World Factbook, the United States has family income distribution Gini Index score of 45.0, which makes the United States rank thirty-ninth out of one hundred and thirty four countries in that category. Namibia ranks first, with a Gini index score of 70.7. Previously, the United States ranked forty-third in this category. Freedom of Press: According to Gallup, 87% of Americans believe that the United States has a free media. That is enough to make the United States tied for fifteenth with Senegal out of one hundred thirty-three countries ranked in that category. Finland ranks first, with 97% of Finns believing that their country has a free media. Finland, Sweden and Denmark are top three. Retirement Security: According to the Melbourne Mercer Global Pension Index, as of June 2013, the United States ranks ninth out of eighteen countries ranked according to financial security in retirement, with a score of 59.0. Denmark ranks first, with a score of 82.9, followed by Netherlands and Australia. This rank of nine is in the richest country in the world. Living the Good Life: According to the OECD “Better Life Index,” the United States ranks sixth in terms of overall quality of life among thirty-six industrialized democracies. Australia, Sweden and Canada are top three. Women’s Index: According to Save the Children’s publication, State of the World’s Mothers 2010, the United States ranks twenty-third out of forty-three “more developed countries” in the “Women’s Index” ranking. Australia, Norway and New Zealand are top three. Union Membership: According to the OECD, 12% of American workers were union members in 2004, which made the United States rank twenty-seventh out of thirty OECD member nations. Sweden ranked first, with 77.3% of workers as union members. Recent numbers (as of August, 2017) will not be too different. Happiness: According to the Earth Institute at Columbia University, the United States ranks eleventh in the “Average Cantril Ladder,” a measure of happiness. Denmark ranks first followed by Finland and Norway. So if anybody tells you that America is “The Greatest Country in the World, tell him: “Don’t give me that ‘Bull Sheet’. I know better”. Chaitanya, born in Bhavnagar, Gujarat, India, is an author, the Founder of Pragati Foundation, an Industrialist, a social activist, a highly progressive individual and an environmentalist; lives with his wife Amita in California, USA. Attended college at New Mexico State University, Las Cruces, New Mexico and graduated with B.S. in Chemical Engineering in 1969. Started his own company in 1980 manufacturing metal finishing chemical products. The company is still running successfully. He is founder/president of a non-profit charity organization named ‘Pragati’, based in Southern California and Hemubhai Rural Development Foundation based in India. The foundation has done rural developmental work in villages in India since 1993. He has travelled extensively all over the world and runs a non-profit rural development foundation. 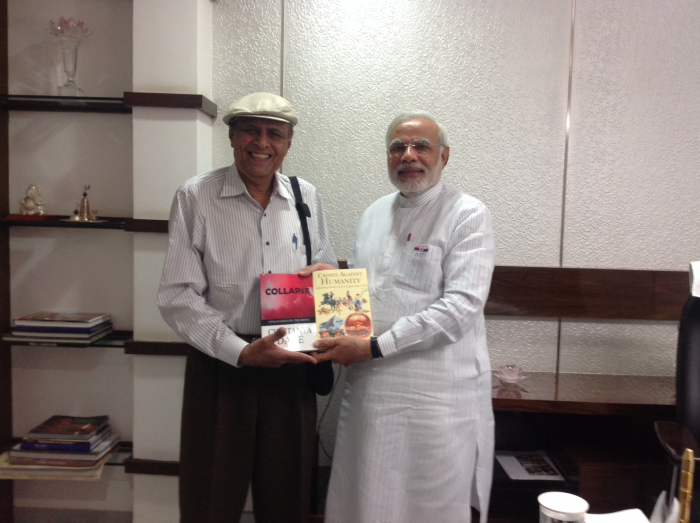 On December 2013, Chaitanya Dave met in person with the Chief Minister of Gujarat, Shri Narendrabhai Modi, about six months before he became the prime minister of the largest democracy in the world, India. Early on Chaitanya Dave learned that only through good education and focused hard work can one come up in life. That is what he did developing his successful metal finishing company against all odds and very little money, in Los Angeles in 1980. He learned that there is no substitute for hard work. He derived these and other principles from great men like Mahatma Gandhiji and Sardar Vallabhbhai Patel. Amita Dave has M.S in education from Pune University and also a Master’s degree in Special Education in the USA. She has been a teacher, administrator and advisor in the field of Special Education with the Los Angeles Unified School District. Though retired now, she continues to take assignments in her field. Dr Aditya Dave, a Veterinarian, currently doing his residency at Minnesota State University, St. Paul, Minnesota. Work hard, read a lot, learn a lot, and enjoy your life with your family and friends while helping others too.